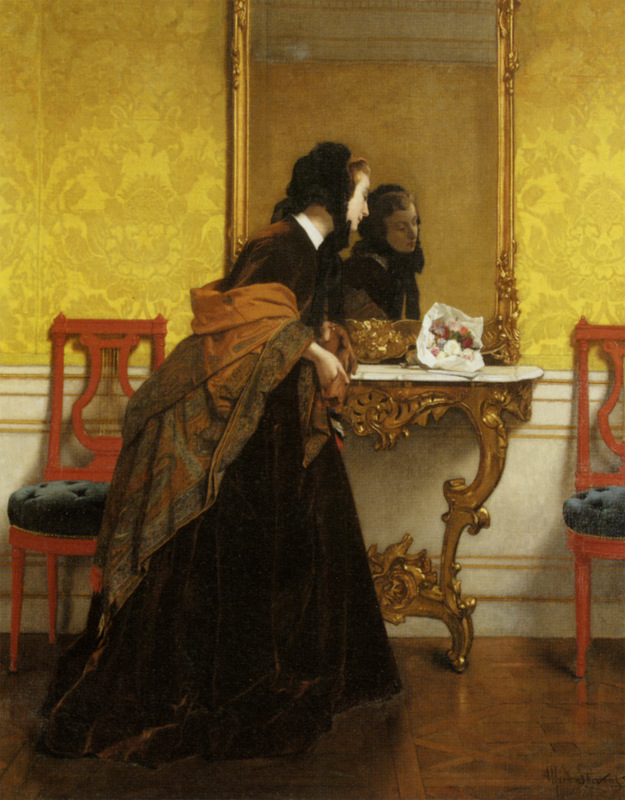 What became of James Tissot and Alfred Stevens? 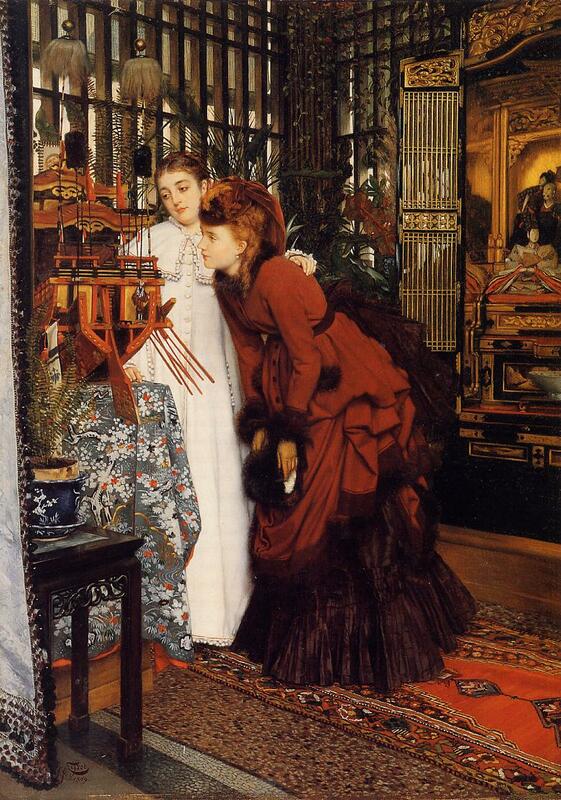 By 1867, James Tissot (1836 – 1902), like his older friend and mentor, Alfred Stevens (1823 – 1906), was a wealthy easel painter, well-connected and prominent in Paris, both depicting the affluent life of Second Empire France. 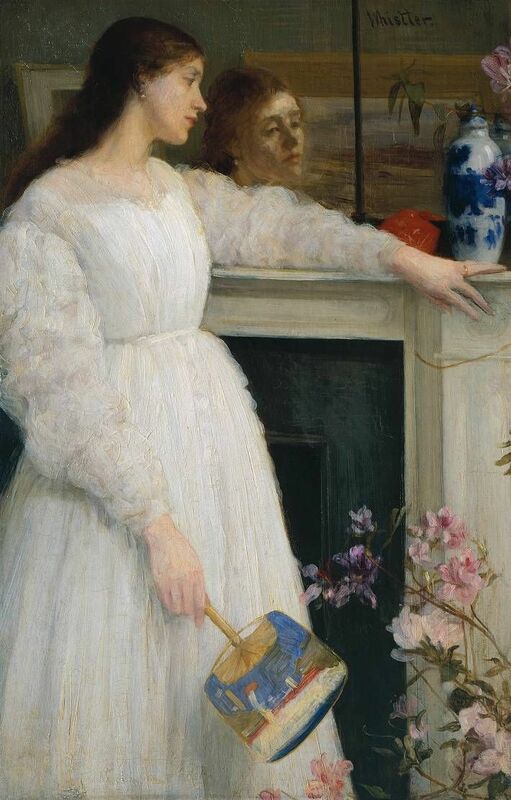 They were so successful that the painter Henri Fantin-Latour warned James Whistler that Stevens and Tissot would imitate his Symphony in White No. 3 (1865-67), sent to Paris in 1867. After his success at the Exposition Universelle in Paris in 1867, when Stevens exhibited eighteen paintings, he was promoted to Officer of the Legion d’honneur. According to Berthe Morisot, he was earning about 100,000 francs a year. He had moved several times, always to a more luxurious home. In late 1867 or early 1868, Tissot moved into the splendid new villa he had built near the recreational grounds at the Bois de Bologne, at the west end of the chic avenue de l’Impératrice [now avenue Foch]. But abruptly, everything changed. On July 15, 1870, Napoléon III, Emperor of the French, heeding his advisors in a diplomatic quarrel regarding the succession to the Spanish throne, declared war on Prussia – and its well-equipped and impeccably-trained army. Because there were not enough French troops, a National Guard – a hastily-organized, inexperienced militia protecting Paris – was forming to defend Paris. Every able-bodied Frenchman enlisted. 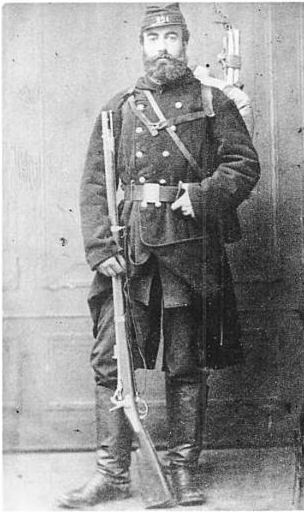 The volunteers were mostly assigned tasks such as standing guard at the city walls or public buildings. Stevens, the son of a former officer under France’s first Empire, was a Belgian citizen but asked the Mayor of France to join the National Guard, saying, “I have been in Paris for twenty years, I married a Parisian, my children were born in Paris, my talent, if I have it, I owe it largely to France.” Now 47, he was assigned to a unit which did not see much action. On Friday, September 9, James Tissot was among the squads drilling along the avenue de l’Impératrice (near his sumptuous, three-year-old villa). [Tissot scholar Willard E. Misfeldt learned that James Tissot actually had enlisted in the Garde Nationale de la Seine, the Fourth Company of the Eighteenth Battalion, in 1855 – as soon as he had arrived in Paris at age 19.]. On September 19, 200,000 Prussian troops encircled Paris in attempt to starve the French into submission. By October 22, James Tissot was armed and fighting on the front line – as well as saving lives as a Red Cross stretcher-bearer. 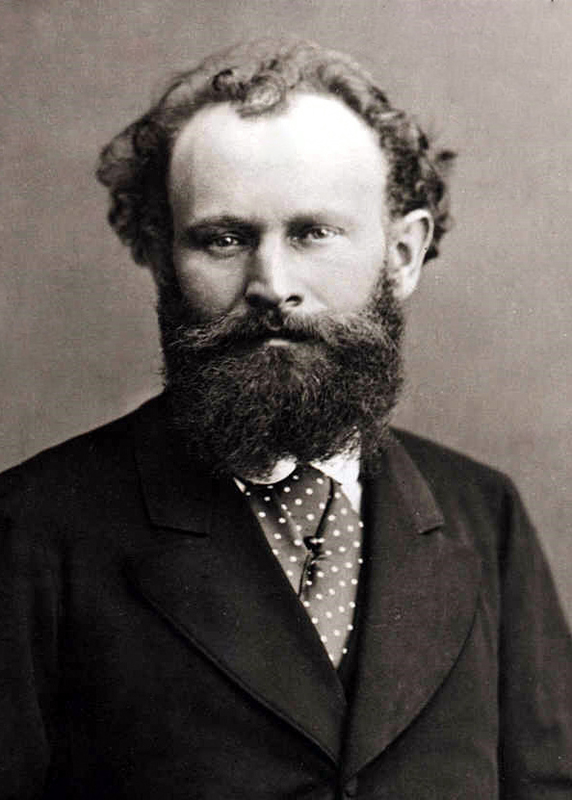 In the months following the Franco-Prussian War and its bloody aftermath, the Paris Commune, Stevens convinced art dealer Paul Durand-Ruel to purchase over twenty canvases by Edouard Manet, one of his many friends. James Tissot moved to London and rebuilt his career. By 1873, he was living in a large house in St. John’s Wood, and in 1875, he built an extension with an elegant studio. That fall, he traveled to Venice with Edouard Manet and his wife, Suzanne, and he bought Manet’s The Grand Canal, Venice (Blue Venice, 1875). 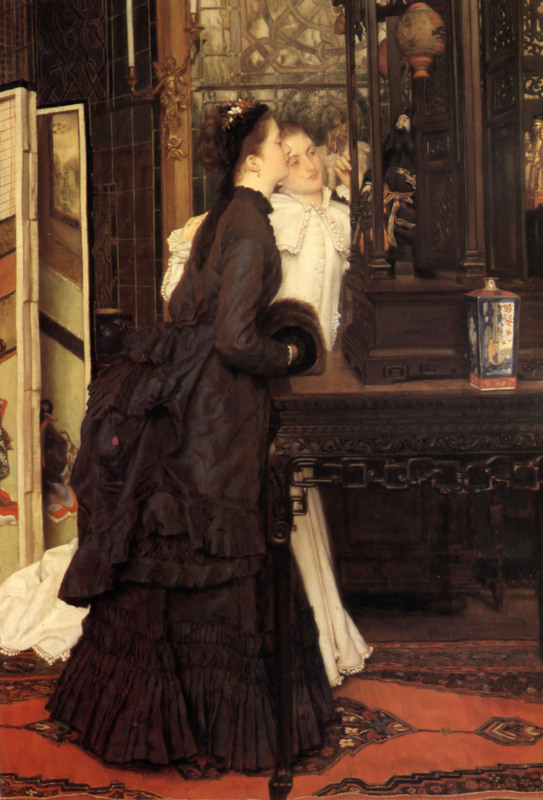 Tissot did not marry, but from 1876, his young mistress lived with him. 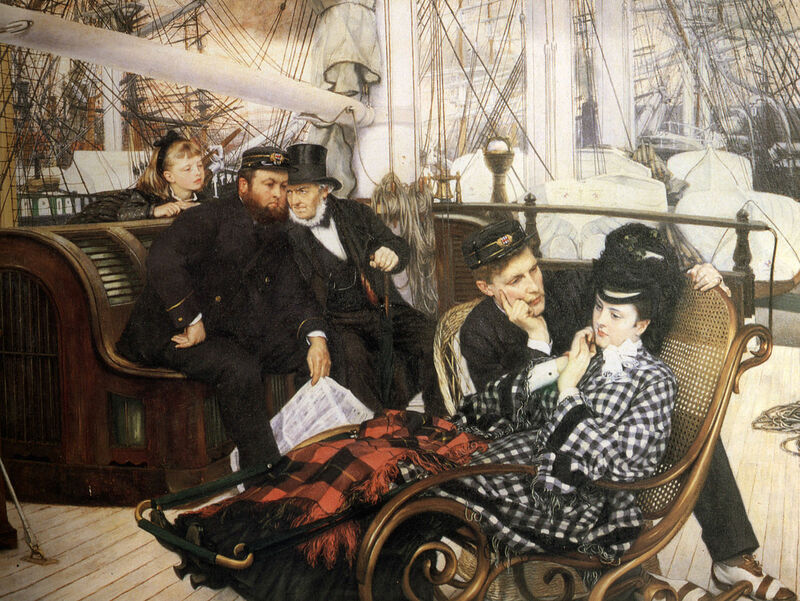 When she died of tuberculosis in November, 1882, Tissot left her two children by one or more previous relationships and moved back to Paris, where he attempted to reclaim his earlier renown. 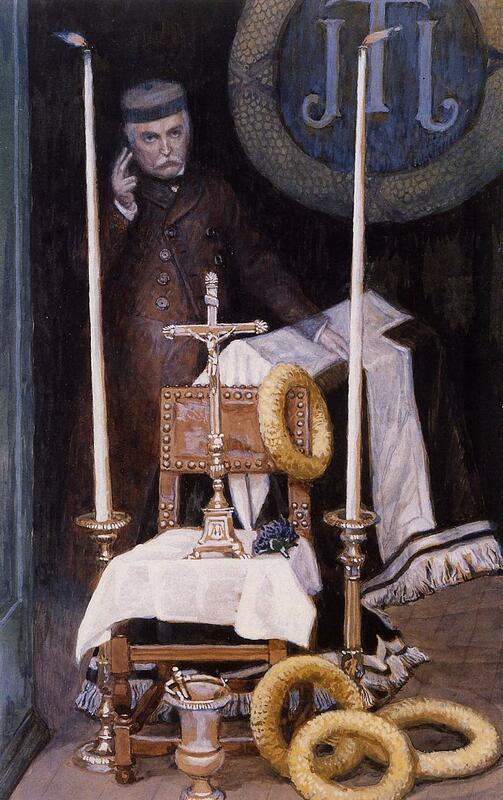 Upon Manet’s death in 1883, the pallbearers at his funeral included Stevens, Zola, Proust, Duret, Fantin-Latour and Monet, but not James Tissot. Stevens helped to organize Manet’s memorial exhibition a year later. Stevens, who had married Marie Blanc, a wealthy Parisian, in 1858 and had four children (two of whom also became painters), continued to live extravagantly in Paris. There he was discovered by several prominent American collectors, including railway mogul William Henry Vanderbilt (1821 – 1885), Baltimore liquor wholesaler William T. Walters (1820 – 1894), and New York sugar refiner Theodore A. Havemeyer (1839–1897). Around 1875, Stevens moved into a sumptuous 18th century residence at 65, rue des Martyrs, near Place Pigalle, with a large English garden. Stevens’ studio was styled to resemble a large Japanese cabinet, with walls of dull gold, black and gold lacquered doors, gilded furniture, and a Japanese shrine. Over the embroidered, white silk window-shades hung gold brocade draperies, the floors were covered in Oriental carpets, and the windows overlooked a large English garden. He collected antiques, Old Masters paintings, and Japanese prints and objets d’art including kimonos, parasols, fans, screens and porcelains. Stevens received writers, painters, musicians and theater people, and he frequented the Café Tortoni and the Café Riche. He started a private atelier which drew wealthy students including Sarah Bernhardt [and incidentally, it is thought that they were lovers]. In 1878, Stevens was promoted to Commander of the Legion of Honor and received another first-class medal at the Salon. 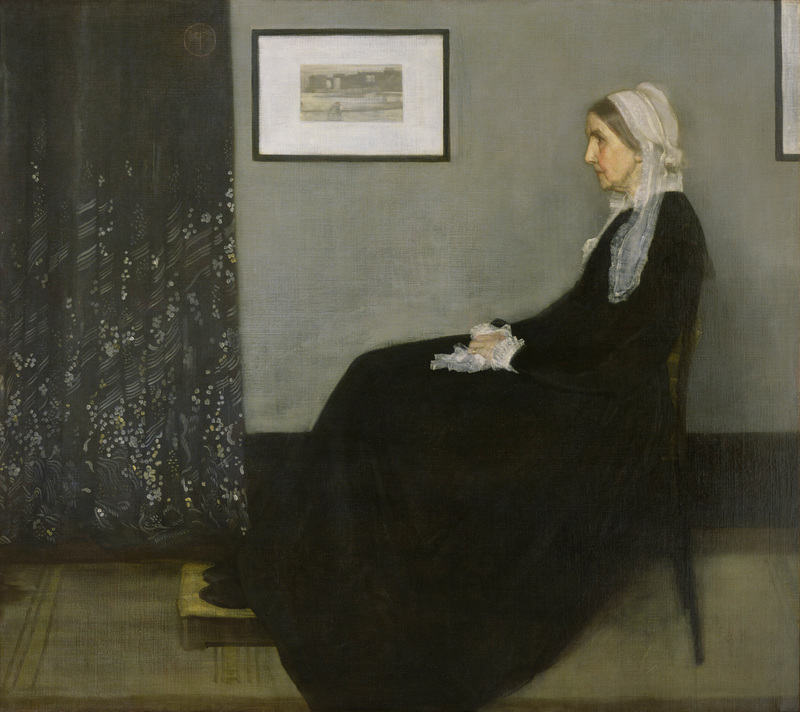 In 1880, railroad manager William Kissam Vanderbilt (1849 – 1920) visited Stevens’s studio, saw Le salon du peintre (1880), and bought it on the spot for 50,000 francs. 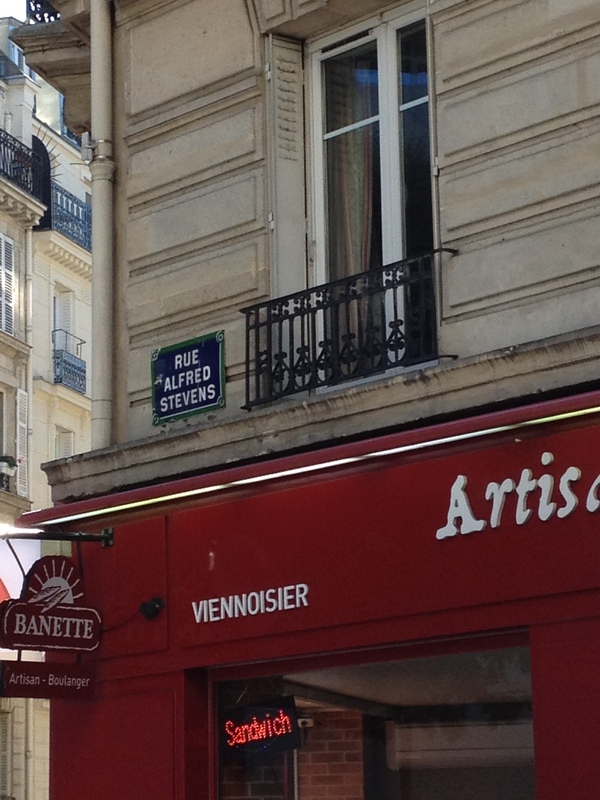 But that year, Stevens was dispossessed as a result of road work during urbanization; he was paid 300,000 francs, and a nearby passage was named rue Alfred Stevens. That year, he was diagnosed with chronic bronchitis, and his doctor advised him to spend summers at the seaside. Stevens went to Sainte-Adresse in Normandy, and art dealer Georges Petit offered him a contract for 50, 000 francs a year for three years, for his entire output of marine paintings. This was a stroke of fortune that helped Stevens fund his trips. Flirting with Impressionism, he made oil sketches of the sea and the coast under changing weather conditions. 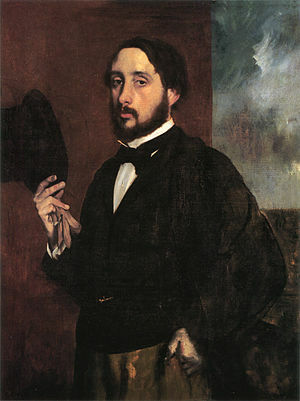 During Tissot’s eleven years in London, he had declined Edgar Degas’ invitation to show his work with the artists who became known as the Impressionists. Now back in Paris, he exerted himself to re-establish his reputation with a series of fifteen large-scale pictures called La Femme à Paris (The Parisian Woman). Painted between 1883 and 1885, they portrayed the fashionable parisienne in various incarnations using brighter, modern colors than he had in his previous work. What Our Lord Saw From the Cross, by James Tissot. Brooklyn Museum, New York. (Photo: Wikimedia.org). 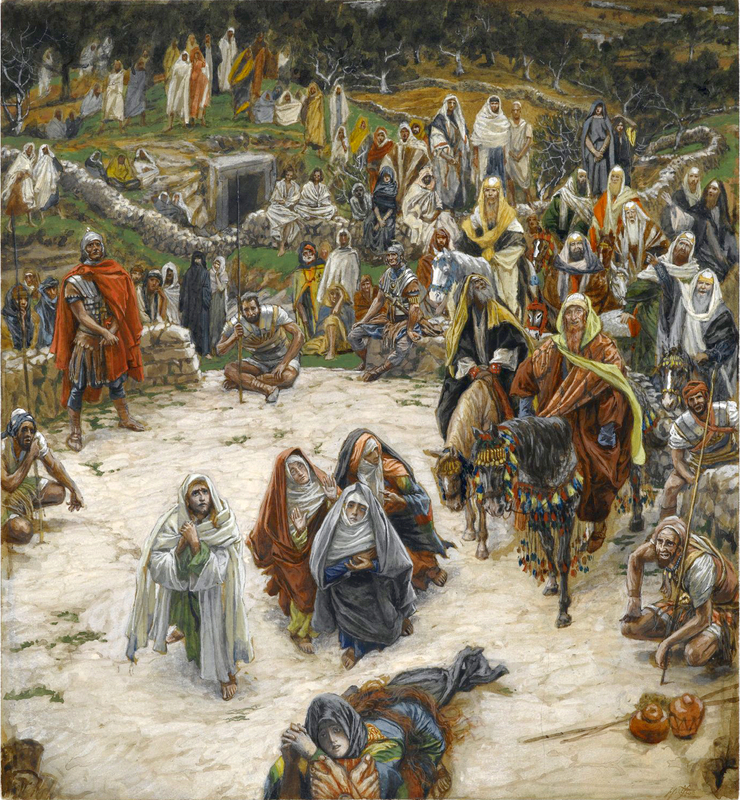 The project ended in 1885 with Tissot’s ambition to illustrate the Bible. He traveled to the Holy Land that year, and again in 1889 and 1896, to make detailed drawings and notes of locations and details, taking photographs as well. He produced 365 illustrations for the New Testament, of which 270 were exhibited at the Salon du Champ-de-Mars in 1894, causing women to fall to their knees with reverence and sob. The illustrations were shown in London in 1896, again in Paris in 1897, and in America in 1898, when they raised over $100,000 in entrance fees and were purchased for $60,000 by the Brooklyn Museum. The Life of our Lord Jesus Christ, illustrated by James Tissot, was published in France in 1896-97 and later in England and America. Tissot was paid one million francs for the reproduction rights. He still owned his house in Paris, and lived with style there and at the château near Besançon, France, that he had inherited upon his father’s death in 1888. 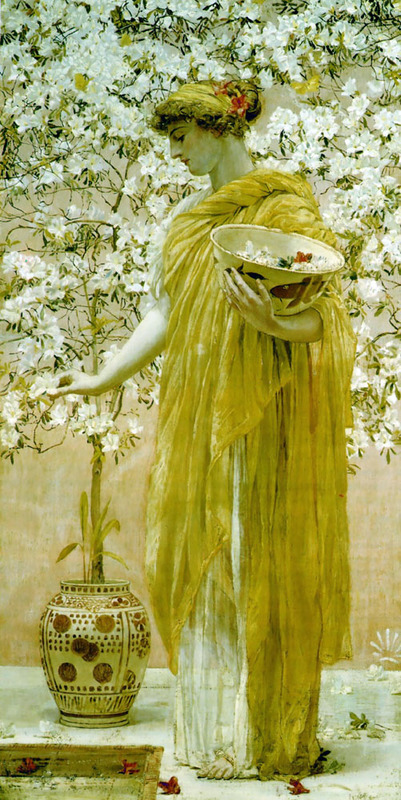 He spent increasing time there, working on illustrations of the Old Testament; English painter Louise Jopling (1843 – 1933) expressed the belief in her 1925 autobiography that Tissot had joined a Trappist monastery in Rome. In 1886, Stevens published Impressions sur la peinture, (Impressions on Painting) which later was published in English and American editions. But he also was involved in a greater work. In 1883, painter Henri Gervex (1852 – 1929, perhaps best known for his 1878 painting, Rolla) conceived an idea for a joint project with Alfred Stevens for the Paris World Fair of 1889: a grand panorama to be called History of the Century 1789-1889. It would depict over 660 life-size figures of significant French men and women from one hundred years of French history between the Revolution to the present. With a team of fifteen assistants that included Stevens’ son, Léopold, the resulting painting was 20 meters (65 ft.) high and had a circumference of 120 meters (nearly 400 ft.). It was exhibited in a specially constructed rotunda in the Tuileries Gardens. After the Exposition, the rotunda was pulled down. No permanent installation could be found for the painting due to its size, and it was cut into 65 sections and distributed among various locations. Only two-thirds of the sections have been preserved. In addition to the photographs and twelve heliogravures from 1889 that captured the complete panorama, Stevens made four small sketches representing the whole panorama (Royal Museums of Fine Arts of Belgium, Brussels) [also signed by Gervex for the sake of courtesy]. At the Salon du Champ de Mars in 1890, Stevens showed eleven works; in 1891, fourteen works; and in 1892 sixteen works. His younger brother, Arthur, died in 1890, his wife, Marie, died in 1891, and his older brother, Joseph, in 1892. In 1895, Stevens returned to Brussels with the intention of settling there, but when he applied for the vacant position of Director of the Brussels Academy, he was rejected. In 1896, he returned to Paris and a year later, in need of money, tried to sell his replicas of the Panorama. Ninety-five of James Tissot’s Old Testament illustrations were exhibited at the Salon du Champ-de-Mars in 1901, the last time his work was exhibited in Paris. He died at age 65 the following summer after catching a chill outdoors at his château, and his illustrations toured America. They were later purchased by the New York Public Library and passed to the Jewish Museum. After a lifetime devoted to art, from which he had earned immense wealth, a sale of the effects from Tissot’s studio in 1903 resulted in the dispersal of his pictures and prints at very low prices. Following the death of his elderly niece, the contents of the decrepit château near Besançon were auctioned off in November, 1964. 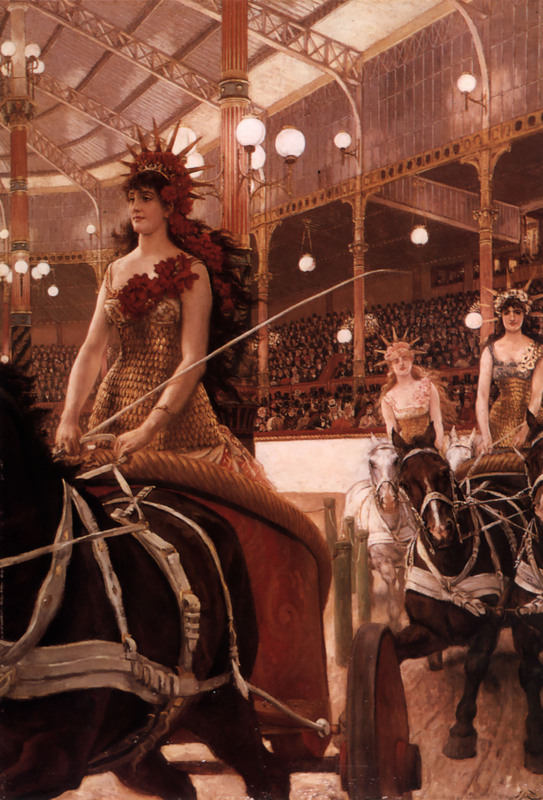 James Tissot and Alfred Stevens, virtually forgotten for decades after their deaths, now are known for their entrancing images of the opulence of Paris life under the Second Empire. © Copyright Lucy Paquette 2015. All rights reserved. 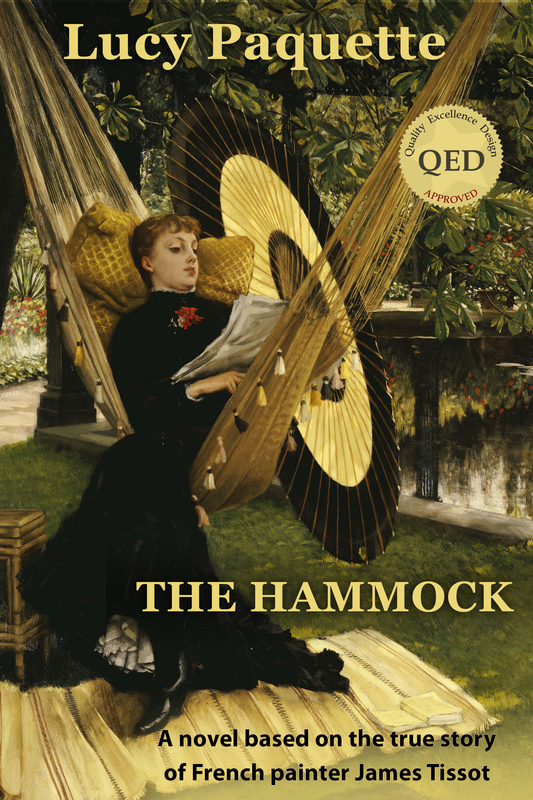 This entry was posted in Art blog, Art History, Impressionists and tagged Alfred Stevens, Édouard Manet, James Tissot on November 18, 2015 by Lucy Paquette, author of The Hammock: A novel based on the true story of French painter James Tissot. 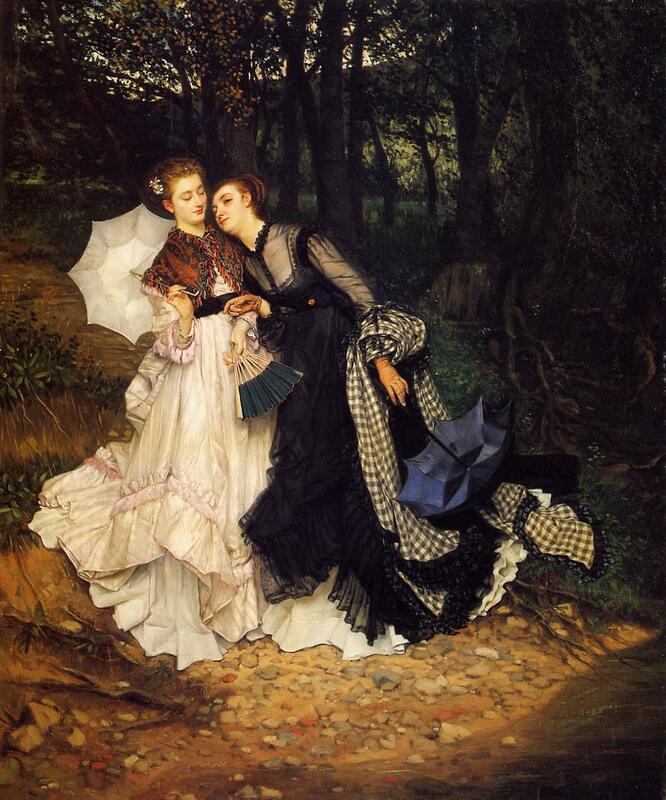 James Tissot’s work often is compared to that of Belgian painter Alfred Stevens (1823 –1906). Stevens was born in Brussels, where he received his first artistic training. His father was an art collector, and his maternal grandparents ran a café that was a gathering spot for politicians, writers, and artists. 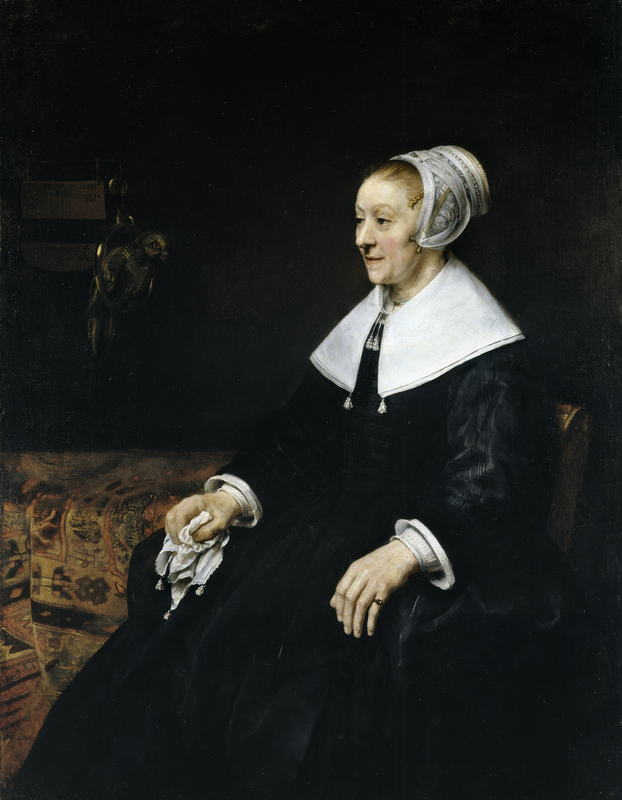 Stevens’ elder brother, Joseph, was a painter, and his younger brother, Arthur, became an art critic and a dealer based in Paris and Brussels who advised the King of the Belgians. Stevens’ father died in 1837, when he was fourteen, and in 1844, he went to Paris. He stayed with a friend, the painter Florent Joseph Marie Willems (1823–1905) and attended the prestigious Ecole des Beaux-Arts. He studied under Camille Roqueplan (1802/03 – 1855), a friend of his father. Stevens first exhibited his work in 1851, with four historical paintings at the Salon in Brussels. The next year, he settled in Paris. 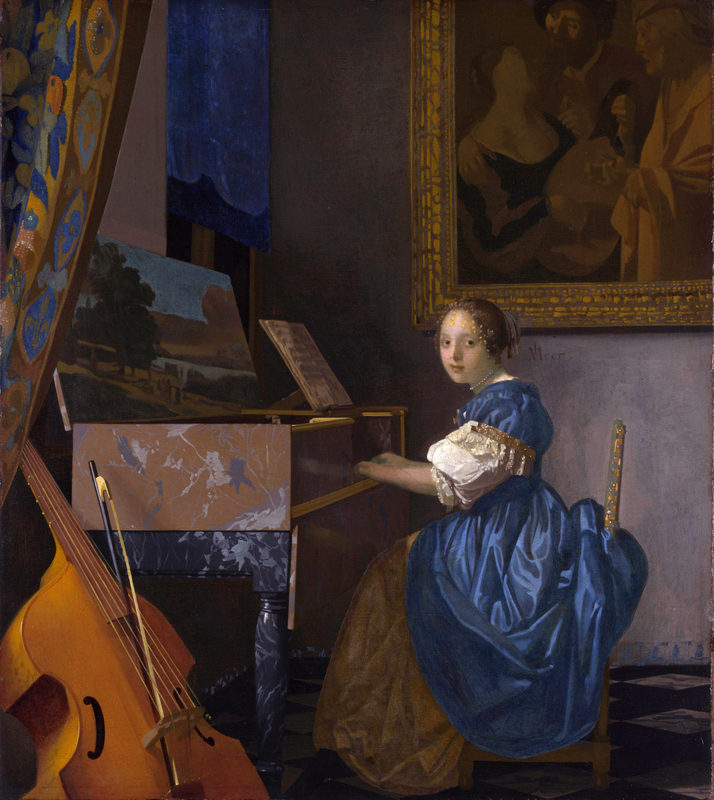 In 1853, at 30, he made his debut at the Salon there with three paintings; he won a third-class medal for Ash-Wednesday Morning, which was purchased by the Ministry of Fine Arts for the Musée des Beaux-Arts in Marseilles. 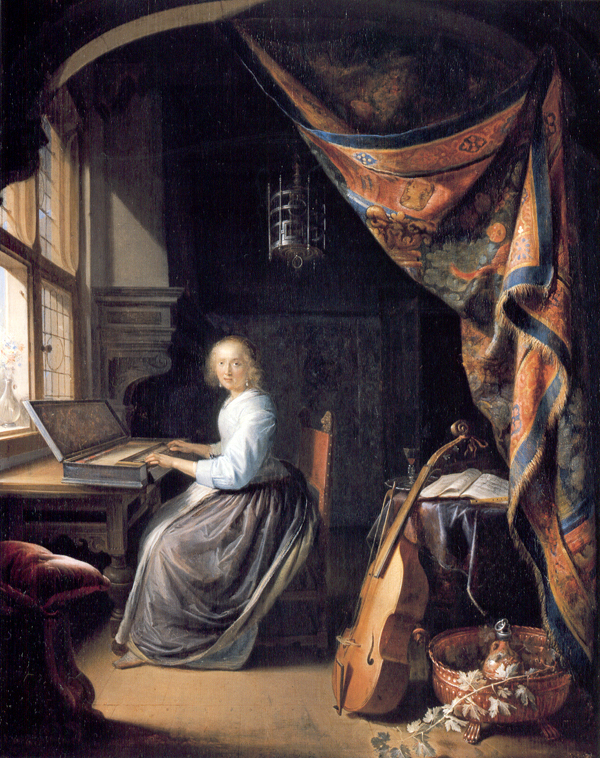 A year later, he also exhibited his first painting of modern life, The Painter and his Model [see below], at the Salon in Antwerp. In 1855, Stevens exhibited six paintings at the Exposition Universelle in Paris and won a second-class medal. Within a few years, he and his elder brother, Joseph, had become widely known and accepted in the Paris art world. 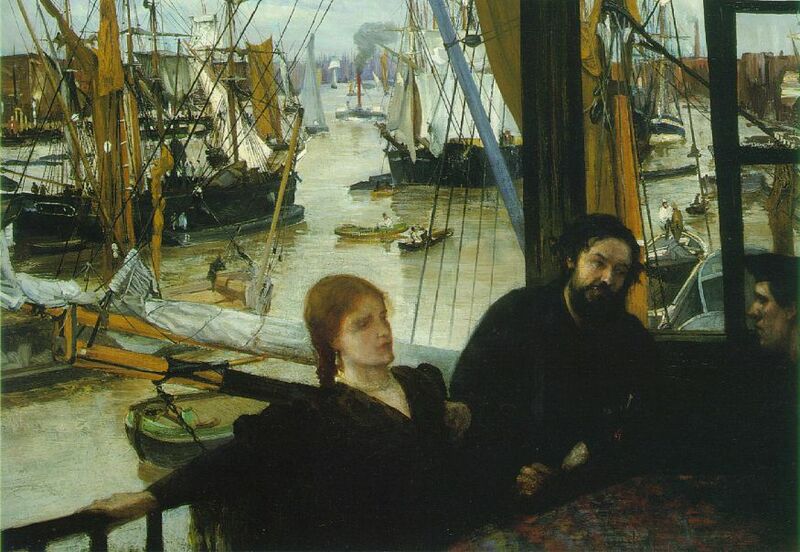 Jacques Joseph Tissot’s parents were self-made, prosperous merchants and traders in the textile and fashion industry in Nantes, a bustling seaport on the banks of the Loire River, 35 miles from the Atlantic Ocean. Tissot left Nantes at 19, in 1856 (i.e. before he turned 20 that October). 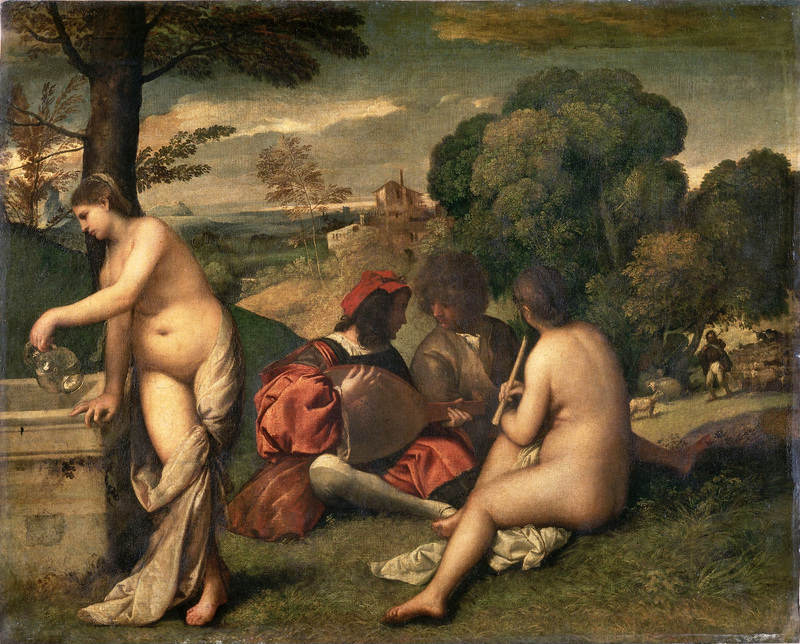 In the spring of 1857, he enrolled at the Académie des Beaux-Arts, though there is little documentation on the regularity of his attendance at classes, which included mathematics, anatomy and drawing, but not painting. 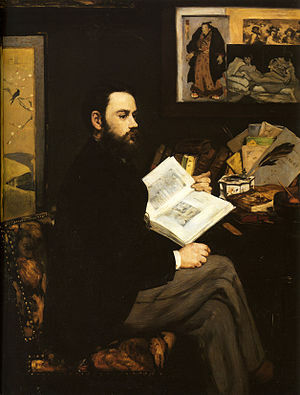 Tissot studied painting independently under Jean-Hippolyte Flandrin (1809 – 1864) and Louis Lamothe (1822 – 1869); both men had been students of the great Neoclassical painter Jean-Auguste-Dominique Ingres (1780 – 1867), and taught his principles. In 1858, Stevens married Marie Blanc, who came from a wealthy Belgian family who were old friends of the Stevens family. Eugène Delacroix, whose paintings were among those that Stevens’ father collected, was one of the witnesses at the ceremony. 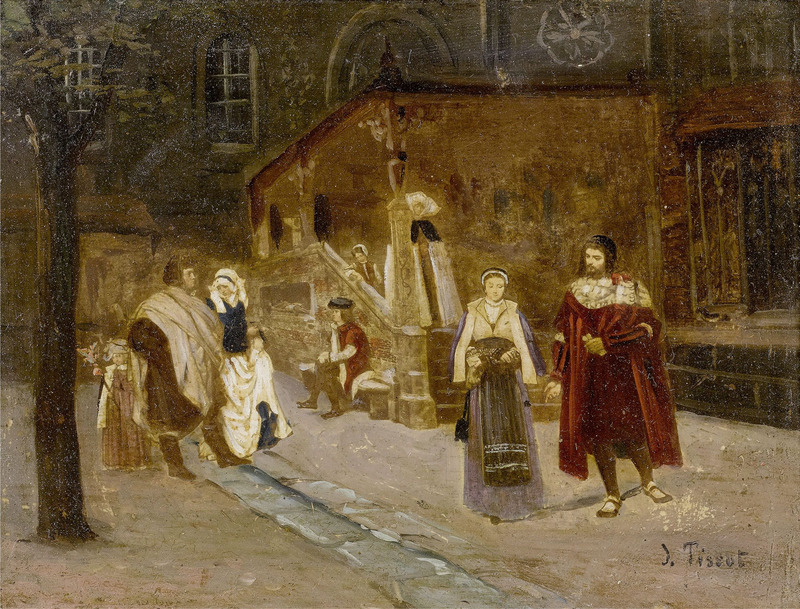 However, Tissot and his painting, Le Recontre de Faust et de Marguerite (The Meeting of Faust and Marguerite) attracted the attention of the Comte de Nieuwerkerke, Director-General of Museums, who purchased the painting by an order of July 17, 1860 on behalf of the government for the Luxembourg Museum for 5,000 francs. 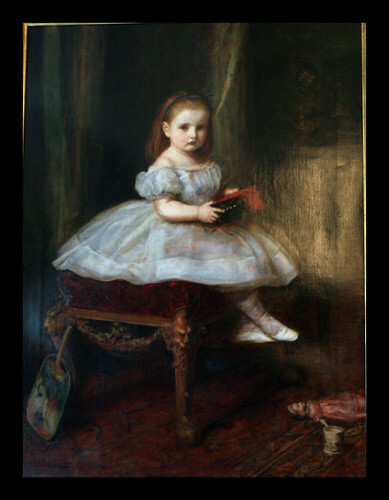 This was a huge honor for the very young artist, who exhibited the painting at the Salon in 1861. 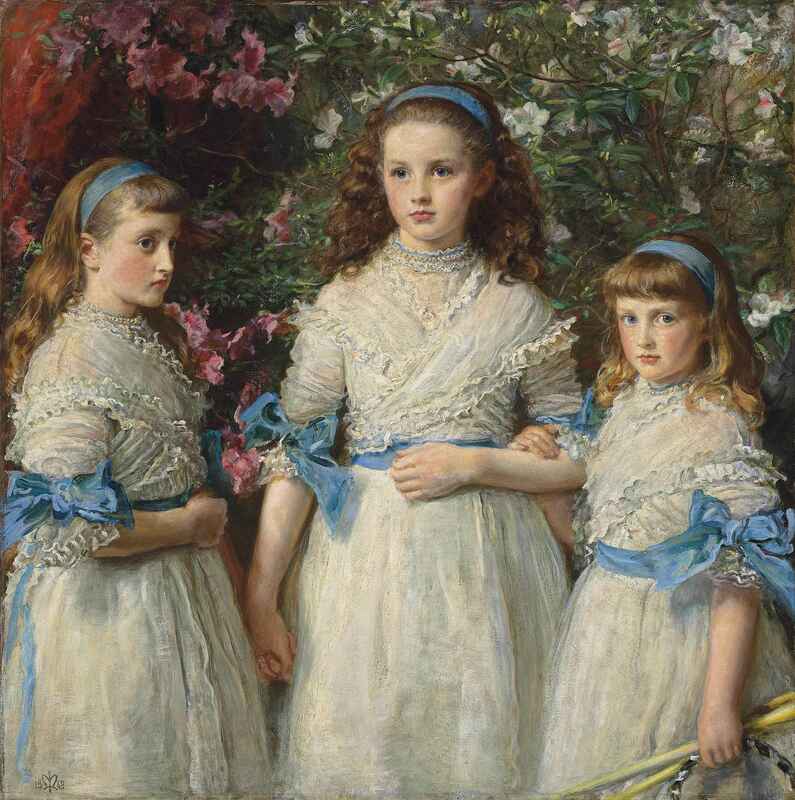 In the 1860s, Stevens became immensely wealthy due his paintings of stylish and refined contemporary parisiennes, characteristically in luxurious private residences, but occasionally in religious settings. Stevens exhibited Les rameaux (Palm Sunday, c. 1862), at the Paris Salon in 1863 (and again at the Exposition Universelle, the world’s fair, in Paris in 1867). In 1863, when he was forty, Stevens received the Legion of Honor (Chevalier) from the Belgian government. 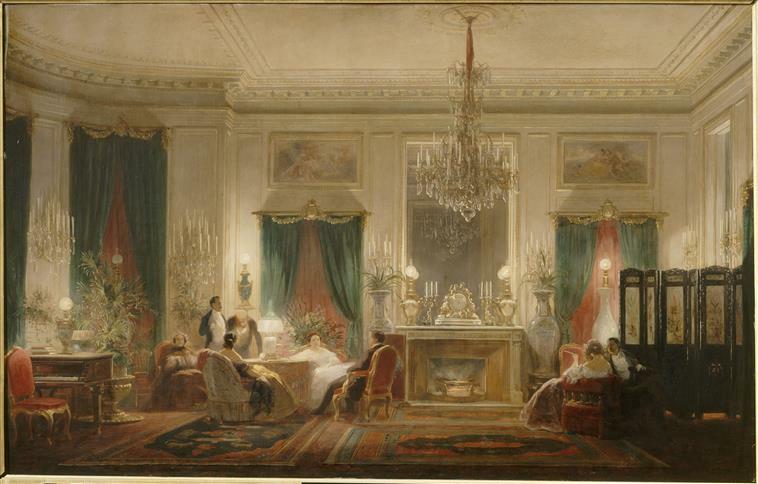 Among the places where Alfred Stevens and his brother, Joseph, socialized were the crowded literary and artistic receptions held weekly by Napoléon III’s cousin, Princess Mathilde. 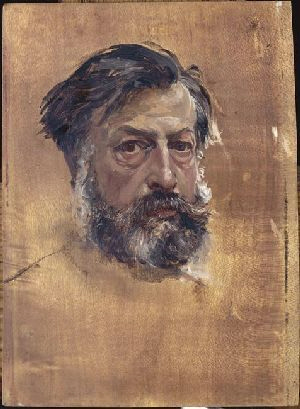 There, he may have met the young James Tissot; another of Tissot’s new friends, the writer Alphonse Daudet, (1840 – 1897), attended these soirées as well. 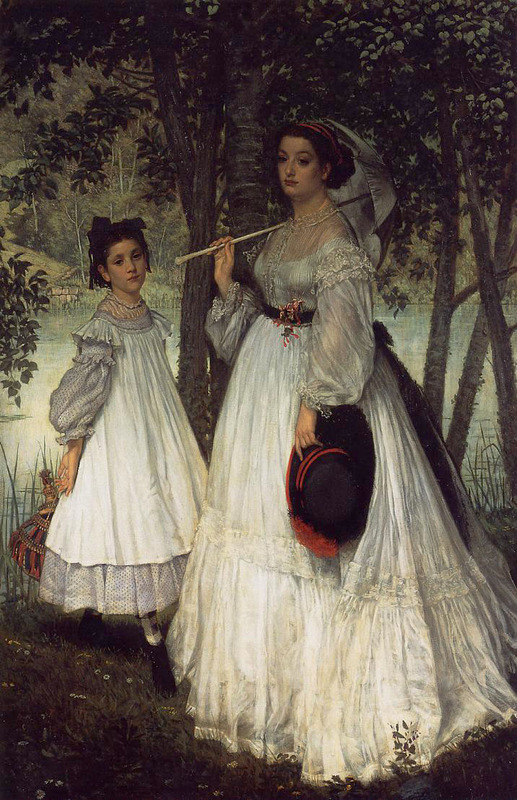 Tissot made a name for himself at the Salon in 1864, exhibiting portraits from modern life that were highly praised: The Two Sisters may have been a double portrait; the elder model reappears in Portrait of Mademoiselle L.L. 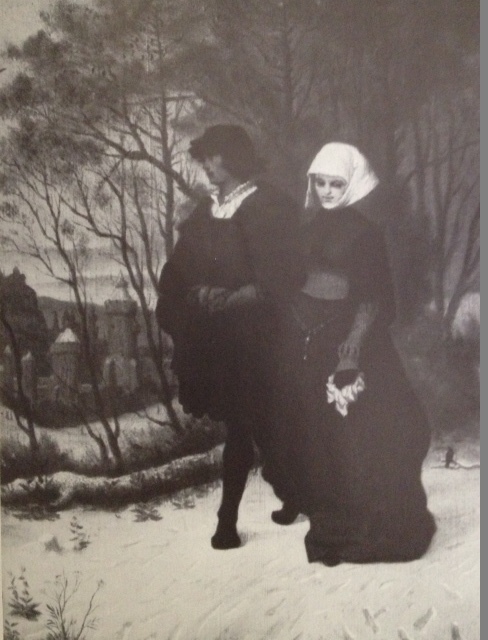 Considering that Stevens began his career with a painting very much in the style of his friend, Florent Willems (compare the two paintings below), he must have enjoyed Tissot’s homage and certainly did not discourage it. Tissot received a medal at the Salon of 1866 which made him hors concours, entitled to exhibit from now on without the jury’s scrutiny, and with this official recognition came financial success. Tissot now was 29 and Stevens was 43. At the Salon in 1867, Tissot exhibited Jeune femme chantante à la orgue (Young Woman Singing to the Organ), depicting a fashionable woman singing a duet with a nun in a church’s organ loft and The Confidence. 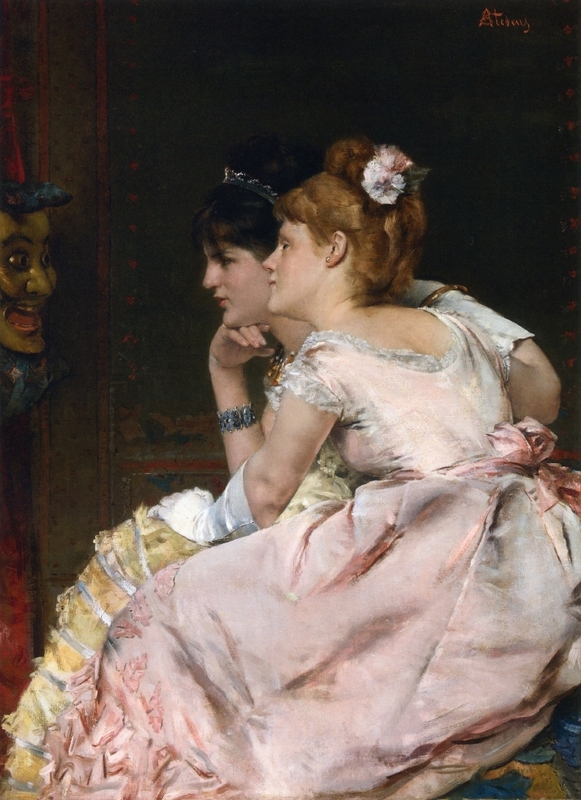 Both owe a debt to Alfred Stevens – although perhaps Stevens’ In the Country (c. 1867) [see below] owes something to Tissot’s The Two Sisters (1863). At the Exposition Universelle in Paris in 1867, Stevens exhibited eighteen paintings, including La dame en rose (Woman in Pink, 1866), and he won a first-class medal; he was promoted to Officer of the Legion of Honor and invited to an Imperial ball at the Tuileries Palace. Tissot exhibited Portrait of the Marquise de Miramon, née Thérèse Feuillant, a stunning portrait of the wife of one of his new, aristocratic patrons. The 30-year-old Marquise wears a pink velvet peignoir while leaning on the mantel in her sitting room at her husband’s château in Auvergne with a stylish Japanese screen behind her. 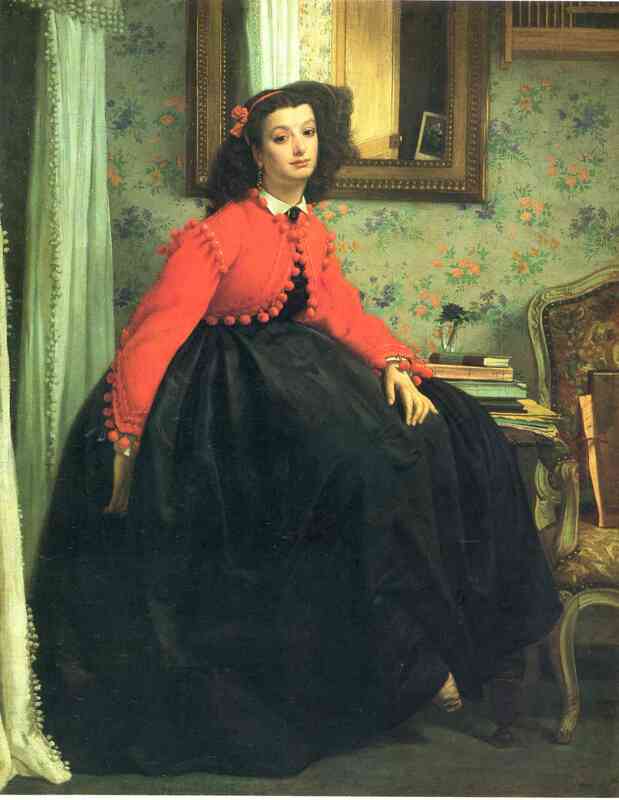 Portrait of the Marquise de Miramon, née, Thérèse Feuillant (1866), by James Tissot. 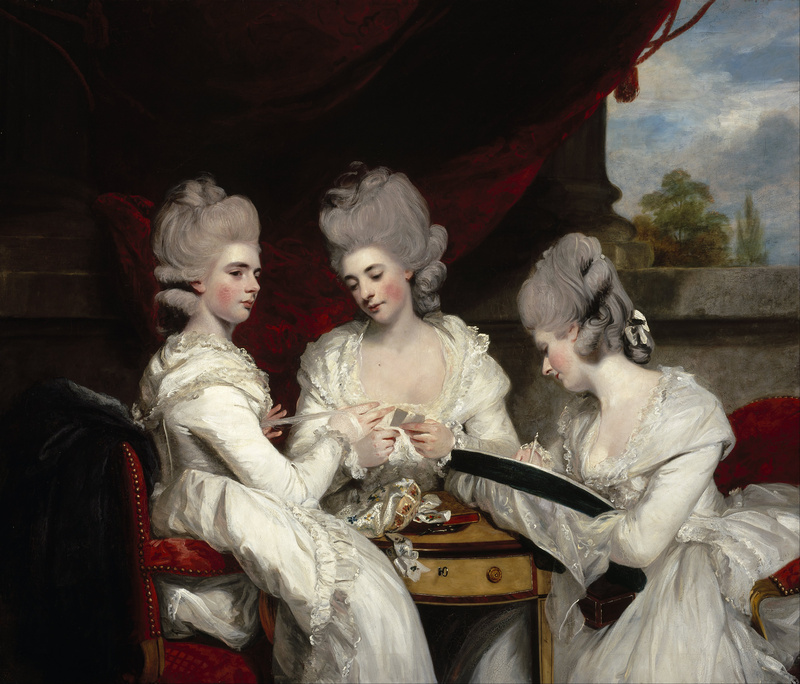 Digital image courtesy of the J. Paul Getty Museum’s Open Content Program. 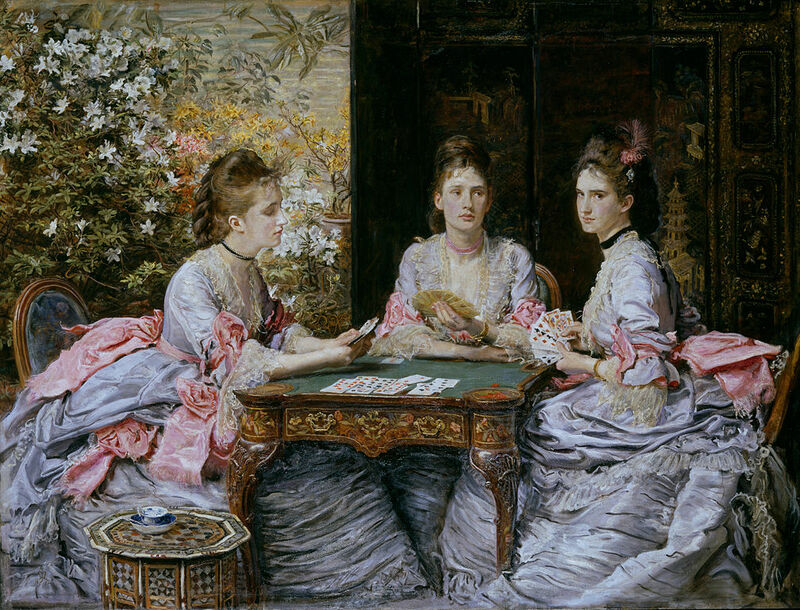 Tissot and Stevens moved in the same social circle, which included Edouard Manet, Edgar Degas, Frédéric Bazille, Berthe Morisot and James Whistler as well as Dutch painter Lawrence Alma-Tadema. 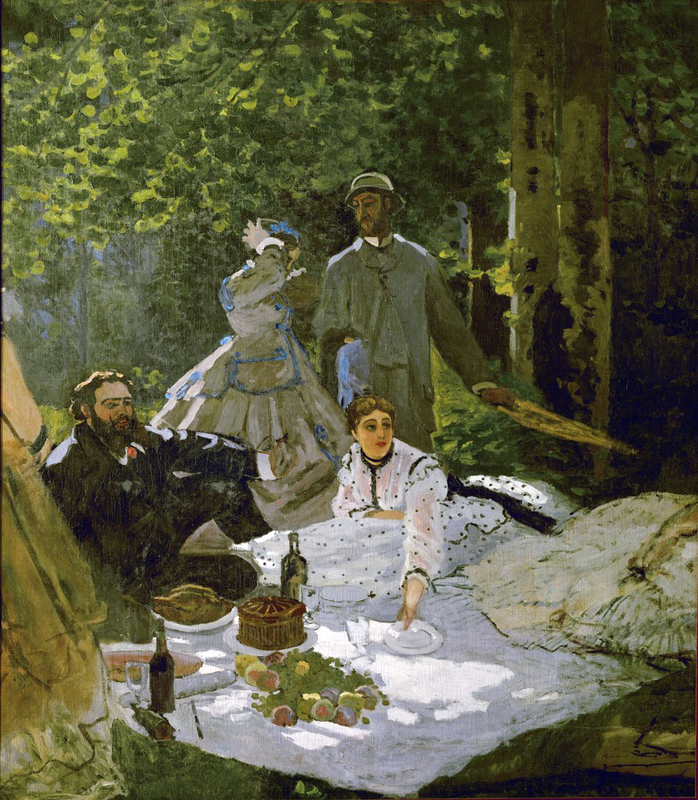 But while Tissot is said to have preferred quiet evenings with his friends in his splendid new home on the chic avenue de l’Impératrice (now avenue Foch), Stevens often gathered with friends at the Café Guerbois. In addition, he and his wife held regular receptions at their home on Wednesdays; weekly soirées were held by Madame Manet (Edouard’s formidable mother) on Tuesdays, Madame Morisot (Berthe’s formidable mother) on Thursdays, and Princesse Mathilde on Fridays. Both James Tissot and Alfred Stevens had grown wealthy depicting the elegance of Parisian life during France’s Second Empire. But their comfortable lives were about to change. 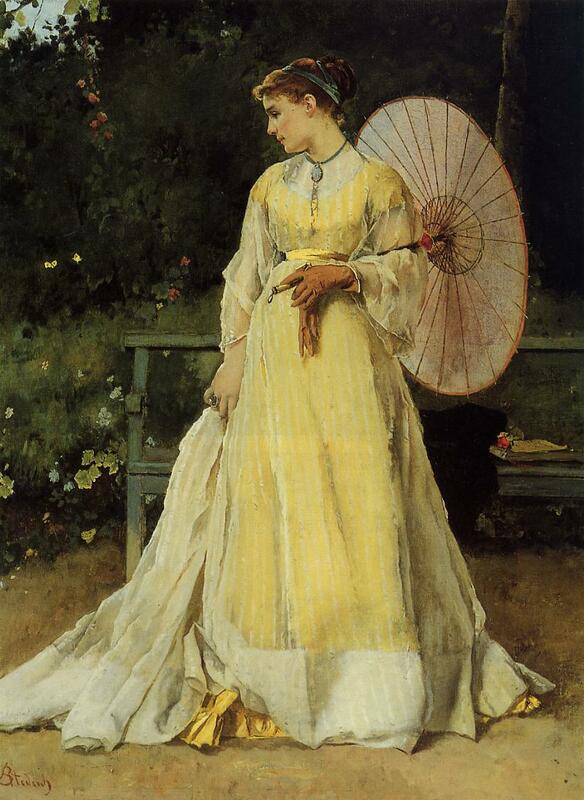 This entry was posted in Art blog, Art History, Impressionists and tagged Alfred Stevens, Alphonse Daudet, James Tissot, James Whistler, Princess Mathilde Bonaparte on September 15, 2015 by Lucy Paquette, author of The Hammock: A novel based on the true story of French painter James Tissot. In September, 1870, Edgar Degas, now 36, was working on the coast. He returned to Paris and enlisted in an infantry unit with the National Guard. When he could not see the target clearly at rifle practice, he realized he was losing vision in his right eye. He told another friend that it had been confirmed that his eye was almost useless, and he blamed this on the fact that he had been sleeping in a damp attic. Berthe Morisot, 29, remained in Paris with her mother and father at their house in Passy. Her father, Chief Clerk of the Audit Office, was required to stay in Paris. He wanted his wife and daughter to leave, and Édouard Manet tried his best to scare the Morisot women into leaving, but they stood firm. “I am not worried,” Madame Morisot wrote, “I think we will survive.” By September 12, National Guard soldiers were quartered in their studio, and Berthe could not paint. On September 19, 200,000 Prussian troops encircled Paris in attempt to starve the French into submission. No one could enter or leave the city; all communication between the French capital and the outside world was cut off. The Siege of Paris had begun. In early October, Degas was transferred to the artillery and was posted to the Bastion 12 fortifications, just north of the Bois de Vincennes, a large public park on the eastern edge of Paris created by order of Napoléon III between 1855 and 1866. He served under the command of his old school friend, the engineer and entrepreneur Henri Rouart. Well east of the action, Degas had the leisure to read and draw. 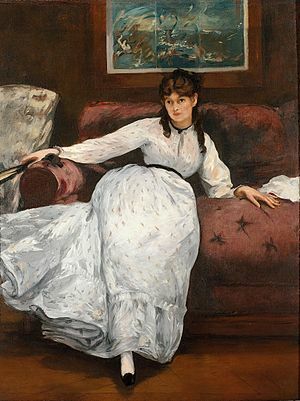 As for Édouard Manet’s protégée, Eva Gonzalès, she had fled with her family to Dieppe, a French port on the English Channel, where the twenty-one-year-old received many letters from Manet describing conditions in Paris as well as sentiments such as, “Of all the privations the siege is inflicting upon us, that of not seeing you any more is certainly one of the hardest to bear.” But he told her that he had no excuse for wasting his time, as he carried his paintbox and portable easel in his military kitbag. He sketched scenes of the people and activities around him (such as his National Guard comrades, and Parisians in line at the butcher shop), writing his wife that these pictures would become valuable souvenirs of the war. In a November 19 letter to Gonzalès, Manet wrote, “A lot of cowards have left here, including Zola, Fantin, etc. I don’t think they’ll be very well received when they return.” In early September, 1870 the writer Émile Zola, 30, had fled to Marseilles in southeastern France with his mother and his new wife, Alexandrine, joining Cézanne (his childhood friend) and his mistress. Around Christmas, Zola and his wife went to Bordeaux, in southwestern France. Thirty-four-year-old painter Henri Fantin-Latour holed up in the cellar of his Paris studio. 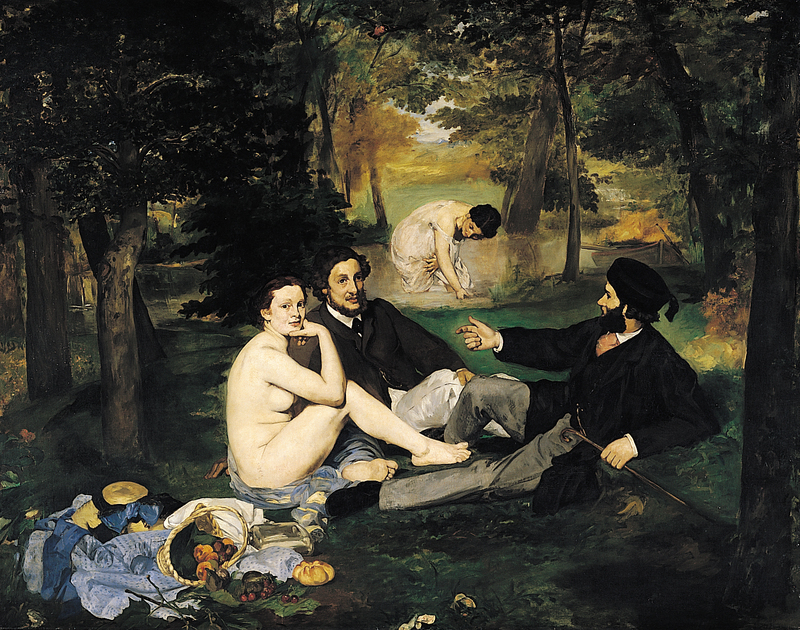 Manet later called Gustave Courbet a coward as well – and not only because Courbet, a socialist and pacifist who did not join the National Guard, sewed a red stripe up his trouser legs in imitation of a military uniform. How much do you know about the Impressionists & War? Take my quiz on goodreads.com! 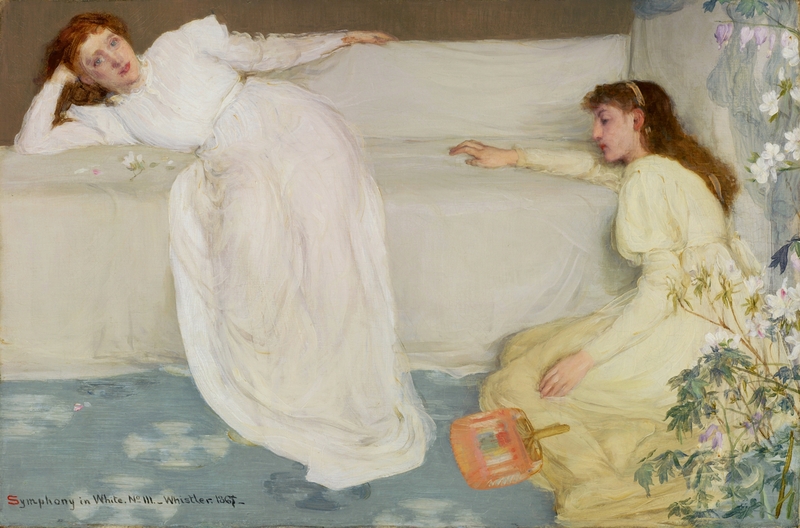 This entry was posted in Art blog, Art History, Impressionists and tagged Alfred Stevens, Édouard Manet, Émile Zola, Berthe Morisot, Edgar Degas, Ernest Meissonier, Eva Gonzalès, Ferdinand Heilbuth, Gustave Courbet, Henri Fantin-Latour on March 18, 2013 by Lucy Paquette, author of The Hammock: A novel based on the true story of French painter James Tissot. One of the most dazzling exhibits at the 1867 Paris International Exposition was the Japanese Pavilion, and it received more visitors than any other exhibit. This was the first World’s Fair in which Japan participated. The Japanese Imperial Commission to the Exposition was led by fourteen-year-old Prince Tokugawa Akitake (1853-1910), a younger brother of the man who would be the last Shogun under Japan’s feudal regime. 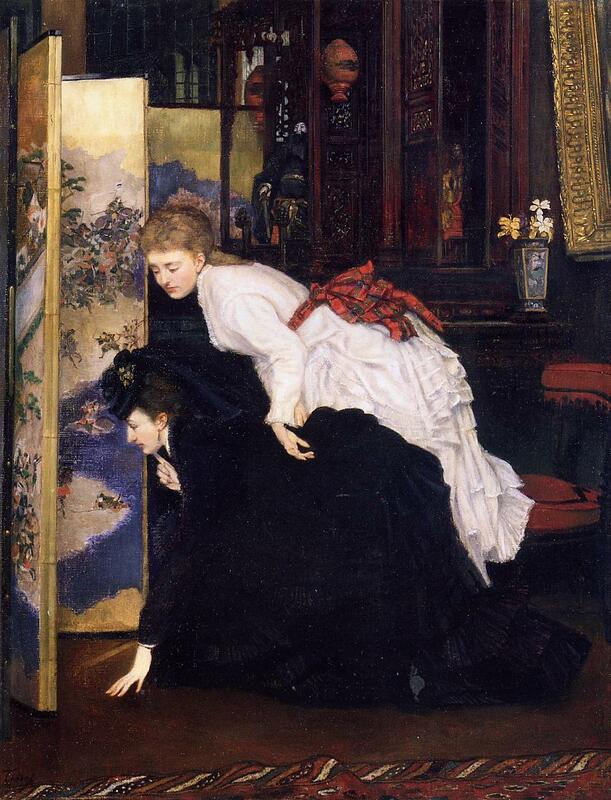 How was it that 31-year-old James Tissot was appointed to this position with a Japanese prince? 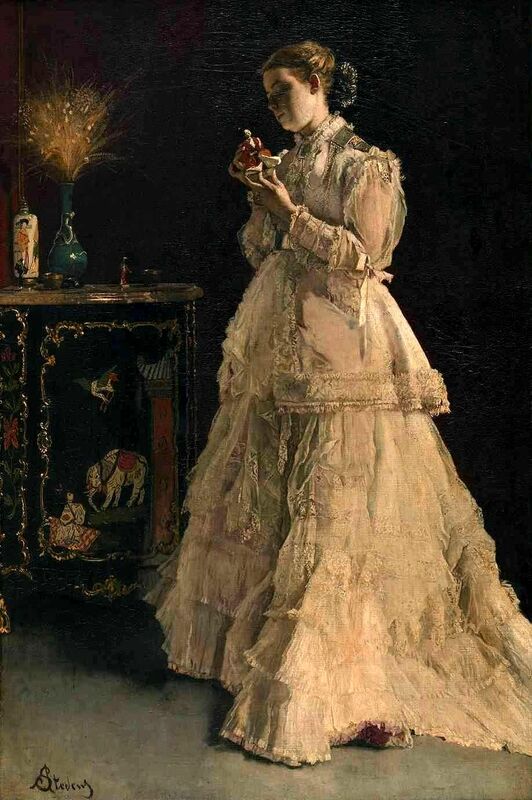 Alfred Stevens, who had been a successful painter for a decade and who was now 44 years old, was an avid collector of japonisme and diligently capitalized on the cultural craze for exotic arts and crafts. 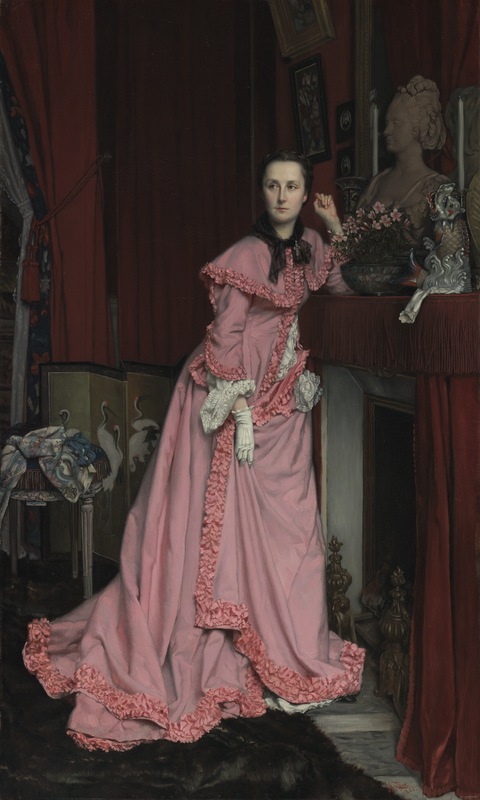 In fact, Stevens won a gold medal at the International Exhibition, where he displayed The Lady in Pink (1867, Musées Royaux des Beaux-Arts de Belgique, Brussels, Belgium); it depicted an elegantly gowned woman near a Japanese carved and painted table, admiring a doll from “her” collection. Though Stevens was much admired by the Imperial family, was he perhaps too busy to teach art to a foreign teenager? 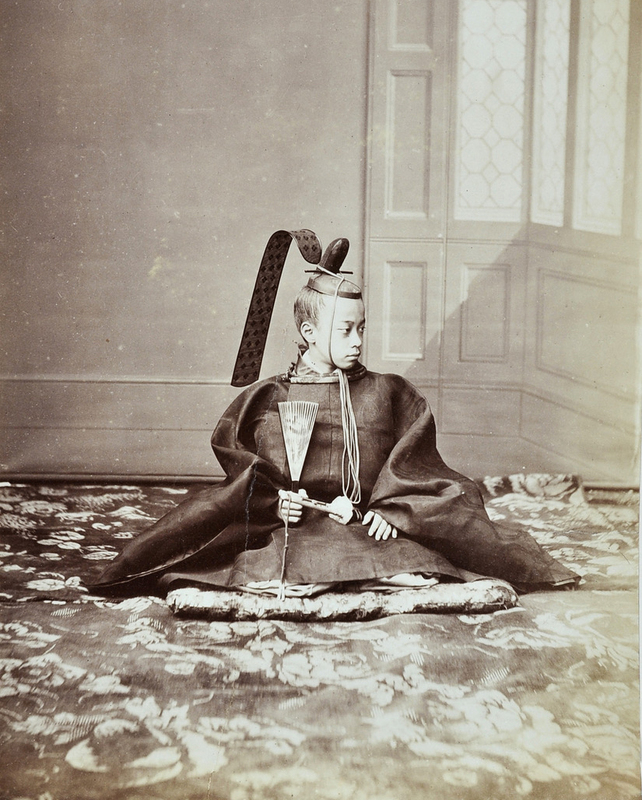 Did the ambitious, younger Tissot seek the appointment, or was he perhaps recommended (through Princess Mathilde) by Napoleon III, whose government was assisting Japan in reorganizing the Shogunate Army? Or was it a coincidence of location — perhaps the young prince’s delegation lodged in the rue de l’Impératrice, where many aristocrats and foreign dignitaries [including Elihu Washburne (1816-1887), the United States Minister to France, and his legation] resided? In late 1867 or early 1868, Tissot moved into his sumptuous new villa and chic “Oriental” studio in the rue de l’Impératrice, displaying his impressive collection of Japanese and Chinese art and artifacts to all who visited, including princes and princesses. Prince Akitake, who called his teacher “Chi-so,” returned to Japan in October, 1868 for the Meji Restoration, an era of modernization and industrialization which brought sweeping reforms in government, the military and the culture. Eight years later, in 1876, Tokugawa Akitake was sent as the special emissary in charge of the Japanese exhibition to the Philadelphia World’s Fair. He returned to France to continue his studies. 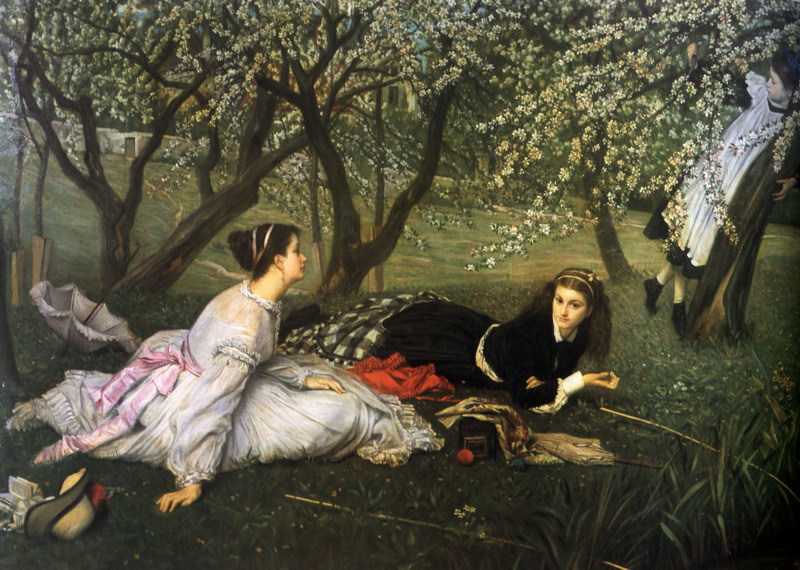 By this time, James Tissot’s carefree existence had drastically changed, and he now lived in London. © 2012 Lucy Paquette. All rights reserved. 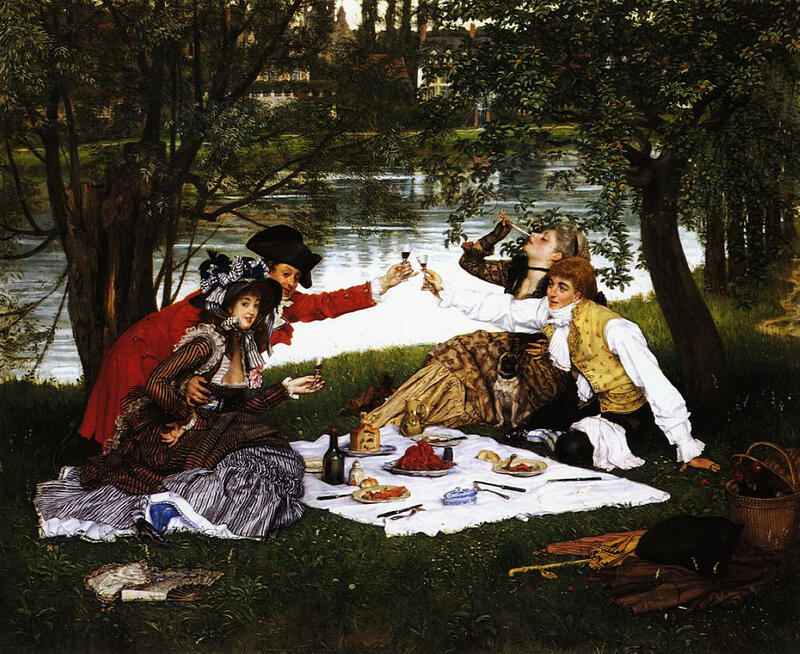 This entry was posted in Art blog, Art History, Impressionists and tagged Alfred Stevens, Elihu Washburne, James Tissot, Tokugawa Akitake on December 5, 2012 by Lucy Paquette, author of The Hammock: A novel based on the true story of French painter James Tissot.